By late 1800, the French Revolution was going poorly for the British. Britain’s economy was in distress, her allies had been driven from the war, Russia was shifting to support France, and neutral Baltic nations were arming to enforce their maritime rights and neutrality. Yet despite all this Britain fought on alone against France. British armed forces were a tale of two branches. The Royal Navy had cleared the seas of French warships, blockaded the coasts of France, and was well respected. By way of contrast, the British Army had performed poorly ashore in northern Europe, had suffered catastrophic casualties while campaigning in the West Indies, and was universally derided by other European armies.2 Britain needed a military victory to solidify the government’s political position at home and abroad as well as to demonstrate the capability of the newly reformed British Army. The British amphibious operation in Egypt was what the nation needed. Since July 1798, French forces had occupied Egypt. In August 1798, Nelson’s fleet obliterated the French fleet, cutting the French army off from France. After a year of campaigning in Egypt and Syria, Napoleon returned to France. Yet, the French army remained in Egypt, a permanent threat to British India. Britain needed a victory on land to secure room for negotiations at the expected peace conference. 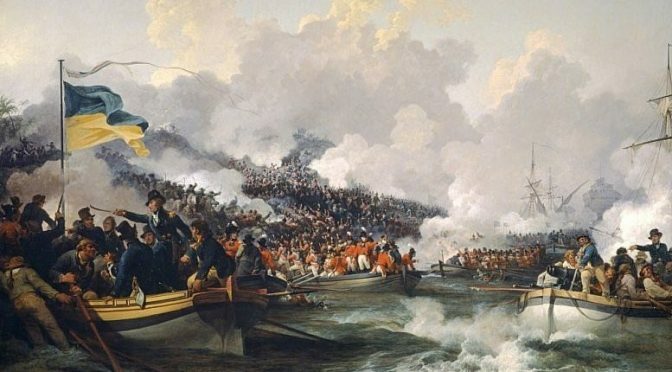 The British joint campaign in Egypt has languished in relative obscurity, overshadowed by Admiral Nelson’s epic naval battle in 1798. When viewed through U.S. Joint Publication 3-02 Amphibious Operations, this campaign provides several lessons on the successful conduct of an amphibious operation. Despite the successful execution of the landing and British victory in the campaign, mistakes made by the national command authority, in intelligence, logistics, planning, and the relationship between the commanding general and admiral caused problems throughout the operation. Even though U.S. amphibious doctrine was developed and refined in the Second World War era and Joint Publication 3-02 is the evolution of those experiences, this essay argues that the principles of a successful amphibious campaign as defined by JP 3-02 are applicable regardless of time period and this historic case study can be analyzed through this doctrine. British politicians agreed that they needed a victory, but where Britain should strike was a matter of debate. The Prime Minister and cabinet debated whether to support another royalist uprising in France, another landing in Holland, Egypt, or somewhere else.4 Surprisingly, despite Britain’s recent support of failed French royalist uprisings and landings in Holland both options were initially more popular than Egypt. Secretary of State for War Sir Henry Dundas spent years improving Britain’s position in India, and did not want French interference to threaten his work. Secretary Dundas and Napoleon agreed Egypt was the key to India. The French Consul in Egypt stated 10,000 French troops could proceed down the Red Sea to India and take Bengal from the British in one campaign. In London, intelligence on French force levels in Egypt were scarce, but estimates were 13,000 French troops demoralized and crippled by the plague. Intelligence Reports stated the garrison of Alexandria numbered 3,000, and scattered through Upper Egypt and Syria were 10,000 more French troops. 5 In reality, the French army in Egypt was closer to 25,000 soldiers, and despite sacrifices and hardship, their morale was high.6 Britain planned to send an army of 15,000 to Egypt.7 Britain also planned to send an additional 3,000 troops from India, but there was little likelihood of coordination between the two forces, and a failed landing would have enabled the French to defeat both forces piecemeal. This faulty intelligence could have proved disastrous to the landing force. British diplomats in Constantinople also believed they had coordinated Ottoman logistical support for horses and gunboats. The naval leadership was no less capable and distinguished. Admiral George Elphinstone, 1st Viscount Keith, successfully negotiated with the mutineers at the Nore in 1798. He served as deputy Commander-in-Chief, Mediterranean under Admiral Lord St Vincent before himself assuming the command in November 1799. Lord Keith experienced amphibious operations during the siege of Charleston in the American Revolution and in 1795, an expedition that captured the Dutch Cape Colony. Lord Keith’s deputy for planning the ship to shore movement was Captain Alexander Cochrane, uncle of Admiral Lord Thomas Cochrane and a distinguished future admiral in his own right. He had served on the American station during the Revolutionary War and was commanding officer of HMS Ajax, a 74-gun ship of the line. “The focus of the planning process is to link the employment of the amphibious force to the attainment of operational and strategic objectives.”9 Initially clear direction for operational and strategic objectives was not given. Campaigns in the Netherlands, France, and Egypt were proposed. Finally, Secretary Dundas tasked General Abercromby and Lord Keith to conduct a landing in Egypt. Secretary Dundas gave the commanders four objectives: eject French forces, restore Ottoman rule in Egypt, protect British interests in India, and secure a better negotiating position for a future peace conference. Secretary Dundas directed the joint force to attempt to seize the Spanish Fleet at anchor in Cadiz before proceeding to Marmorice Bay to receive promised logistical support from the Ottoman Empire and then to defeat the French forces in Egypt accomplish British objectives. Despite almost a decade of war, in 1801, the British army remained small. To create an expedition of 15,000 troops involved redeploying from British deployments around Great Britain, Ireland, and Europe. Not all regiments in the British Army were designated for service outside Europe. Some regiments, particularly militia regiments, were able to volunteer for active service, but only in Europe. High casualty rates in the West Indies meant that few militia regiments volunteered to serve outside Europe. British troops embarked from Ireland and Britain, including units who would not participate in the campaign, but would relieve units in Gibraltar and Minorca that would participate in the campaign.13 The complex embarkation plan shuffled soldiers across Europe, resulted in some soldiers spending months cramped inside troopships waiting to get ashore. The British attempt to land a force to seize the Spanish Fleet at Cadiz was a fiasco. A large portion of that was because there had been no time for a rehearsal. Boats went to the wrong transport, it took hours for soldiers to embark the boats, and then they did not form up properly. The landing was called off and the following day a storm scattered the fleet, and the invasion of Cadiz was over. When the fleet arrived in Marmorice, they planned to spend just a few days to rendezvous with Ottoman naval forces and supplies before proceeding to Egypt. Instead, the expected logistical support from the Ottomans never materialized and the expedition spent almost two months waiting.15 General Abercromby used this time to good effect drilling his troops. This time enabled the force to learn and rehearse their ship-to-shore movement to great effect. For seven weeks, the troops practiced ship-to-shore movements, boats going to the right transport, soldiers embarking the boats, boats forming waves, and soldiers forming line of battle from the boats. The expedition’s movement phase consisted of three phases. Phase 1 consisted of the movement from Great Britain and Ireland to Gibraltar and Minorca where the forces were gathering. This phase included the failed attempt to seize the Spanish fleet at Cadiz. Phase 2 consisted of the movement from Gibraltar and Minorca to Marmorice Bay. Following the Cadiz debacle, the expedition watered and victualed in Africa, and proceeded to Marmorice Bay, Turkey. During this phase a terrible storm scattered the fleet and several days were spent bringing the transports back to the fleet.19 After several weeks, the fleet arrived in Marmorice Bay, whose deep waters and high cliffs proved an excellent anchorage. LT Jason Lancaster is a U.S. Navy Surface Warfare Officer. He is currently the Weapons Officer aboard USS STOUT (DDG 55). He holds a Masters degree in History from the University of Tulsa. His views are his alone and do not represent the stance of any U.S. government department or agency. Michael Glover, Peninsular Preparations, (Cambridge, 1963),pg 3. John Fortescue, A History of the British Army Vol. IV, (MacMillan, 1915), pg 800. Joseph –Marie Moiret, Memoirs of Napoleon’s Egyptian Expedition, 1798-1801, (Green Hill, 2001), pg 160. Piers Mackesy British Victory in Egypt, (TPP 2010), pg 13. Piers Mackesy British Victory in Egypt, (TPP 2010), pg 14. John Moore, The Diary of Sir John Moore, (Arnold, 1904), pp 397-398. James Lowry, Fiddlers and Whores, (Chatham, 2006), pg 59. Aeneas Anderson, Journal Of the Forces, ( Debrett, 1802), pg 201.